As regular readers will know, we at The Amazing Blog team are particularly careful about the skincare products that we use, always erring on the side caution. Very happily, we recently discovered a new skincare launch: EliRose Skincare, a luxurious British brand that is certified organic, vegan, and cruelty-free. Their niche area is to cater to those who suffer from excessively dry skin, eczema, and acne. The Canadian founder Claudia Bussieres wanted to find an 100% organic product, but felt deceived by so many products’ labels. Claudia commented it appeared that 'natural' beauty companies all prioritised product longevity, shelf life, and regulation for cash flow as being more important than the side effects. As a solution, she worked with a team of chemists for over six year, developing her first product the Nourishing Organic Serum, and the start of creating a line of skincare with trusted ingredients. Since some members of our team have sensitive skin and eczema, they were thrilled to try EliRose’s Nourishing Organic Serum with the hope they would experience some relief. The lovely floral fragrance immediately caught our attention. The serum is loaded with beautiful organic oils, such as Bulgarian rose otto oil, evening primrose oil, jojoba oil, sunflower seed oil, pomegranate seed oil, jasmine essential oil, geranium leaf oil, and rosehip seed oil. Combining these oils has a balancing effect, which helps to maintain moisture, prevent hormonal acne, and increase collagen production. This non-greasy formula is a Pure Beauty Global Awards 2018 Winner and made without gluten, PEGs, GMOs, Parabens, silicone, mineral oils, and artificial fragrances. The Nourishing Organic Serum’s soothing formula also applies smoothly with quick absorption time. 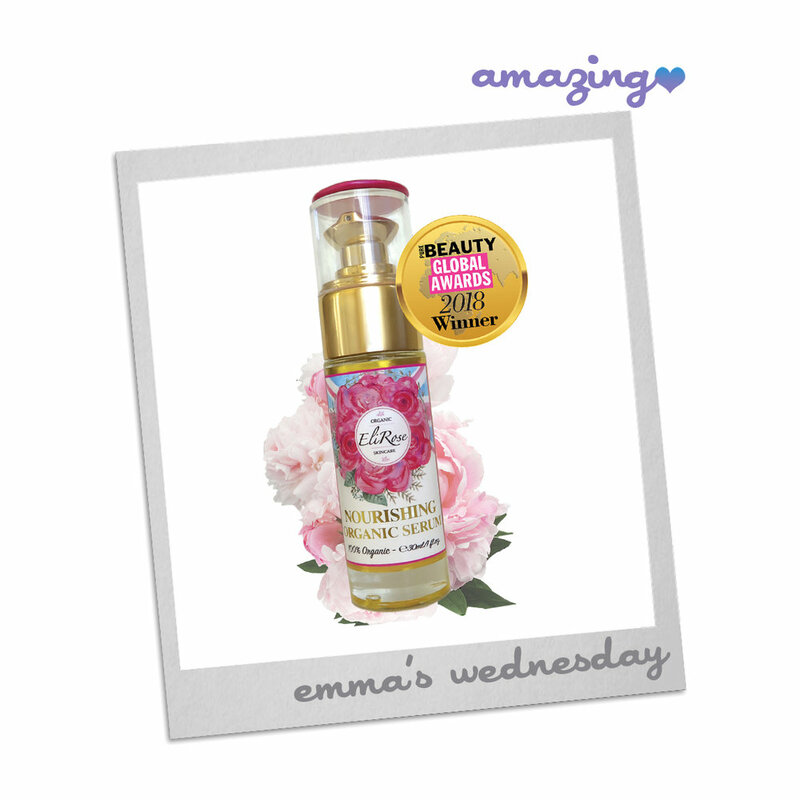 You can purchase the Eli Rose Nourishing Organic Serum 30ml here for £68.00.